A coral reef is a living community built around the accumulated mineralized remains of coral animals, which belong to phylum Cnidaria. The hardened calcium carbonate secretion from coral animals, with mineralized algal cells and other secretions, create nooks and crannies that shelter up to sixty thousand species, including hundreds of types of corals, as well as eels, lobsters, sea slugs, sea horses, sea urchins, turtles, and a huge variety of fishes. A coral reef houses some permanent occupants, and others that come and go. Often life lives within life. For example, snapping shrimp dwell in sponges that occupy crevices in layers of coral. A living coral animal, called a polyp, is small and soft. Polyps collect atop their preserved ancestors, using their waving tentacles to capture prey that floats by. The sticky calcium carbonate exoskeletons that polyps secrete meld them to each other and to the graveyard below. The tides deliver nutrients to coral polyps. Algal and dinoflagellate symbionts live inside the corals and actively photosynthesize, providing nutrients to their hosts and contributing the vibrant colors that give coral reefs their rainbow hues. These guests remove wastes from polyps and maintain water pH at a level that stimulates deposition of the exoskeletons. A million such symbionts may occupy a mere 2 cubic inches of coral reef. Were it not for the photosynthesis that the algae and dinoflagellates provide, the coral could not survive. An aerial view of the Great Barrier Reef, between Cairns and Townsville, Australia. Corals cover 242,000 square kilometers (232,000 square miles) of ocean. Most reefs lie between 25 degrees north and south latitude, with more isolated growths in cooler waters farther from the equator. Most species require clear, warm water of about 20 degrees Celsius (68 degrees Fahrenheit). Less massive corals are found in colder waters that hug continents, including the fjords in Norway and along vertical banks of the coasts of England, New Zealand, Japan, and the western United States. Biologists distinguish types of coral reefs by shape and organization. An atoll is a ring-shaped coral colony that encloses a lagoon, whereas a fringing reef forms next to shores where there isn't much rain, such as on one side of a tropical island. Barrier reefs surround islands or run alongside shorelines, enclosing lagoons. 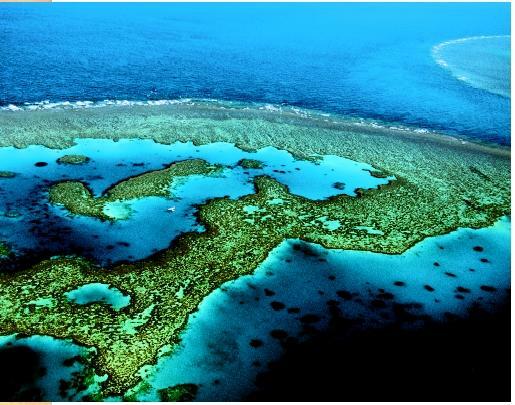 The Australian Great Barrier Reef is 1,303 square kilometers (1,250 square miles) long. Many coral reefs are threatened, either by nature, human activity, or both. Winds destroy the delicate substructure of reefs, which have been damaged both by the large-scale, long-lasting winds of El Niño and more localized but dramatic hurricanes. When stressed by climatic extremes, polyps disgorge their dinoflagellate symbionts, bleaching the coral. In addition, many corals in recent years have fallen victim to bacterial and viral infections. A dozen different viruses, for example, have decimated populations of elkhorn and staghorn corals in the Caribbean. Building near shores threatens corals. Nitrogen and phosphorus fertilizer and soil in runoff from construction upsets the species balance of photosynthesizing symbionts. Snorkelers are warned not to sample the coral, which many people erroneously think are plants or nonliving. In some areas, people catch fish by infiltrating living coral with explosives or cyanide, which often kills the coral and humans along with the fish. With all of these insults, ecologists estimate that by the middle of the twenty-first century, up to two-thirds of coral reefs may be gone. Bryant, Dirk, Lauretta Burke, John McManus, and Mark Spalding. Reefs at Risk: A Map-Based Indicator of Threats to the World's Coral Reefs. Washington, DC: World Resources Institute, 1998. Crossette, Barbara. "World's Imperiled Shores and Coral Reefs to Get Millions in Aid." The New York Times (15 March 2001): F1. Humann, Paul, and Ned Deloach, eds. The Reef Set. Lancaster, CA: New World Publications, 1994. Steene, Roger. Coral Seas. Willowdale, Ontario: Firefly Books, 1998.